thick and thin and slubs really doesn’t work with navajo plying. the weight changes become very abrupt and it’s difficult to pull lumpy yarn through the loops. i did actually choose to put a bit of weight variation into it, plus i didn’t predraft so i got natural lumpy bits. didn’t fight it and try to smooth it out which i now know i should have done. the twist in singles stabilises quicker than you think. i didn’t “overply” this batch as much as the previous ones since it was all spun in the same evening. there was a definite S twist to the finished skein - so much that i’m weighting it - so it needed more twist in the plying. having passed on the advice that if the skein twists Z it needs more Z i’m beginning to doubt it myself, must track down where i read that and double check. red & green doesn’t necessarily look xmassy. i had a sudden moment of horror as i was plying it up as i realised what i’d done, but it really does look fine. the darker red is coming out brown in the yarn and i like it, blends well. i’m on and off with this one, not over-enamoured with the dyed tops, loved it as a singles, had a crisis of confidence once i started to ply but digging it again now it’s skeined up. i’ll be really interested to see where it settles once it’s crocheted. 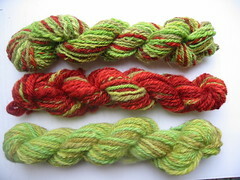 this is the mostly-green skein, there’s a mostly red and an all-green to come. so much for trying to divide into 3 equal skeins! 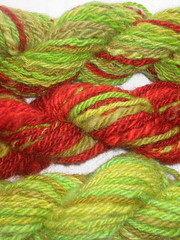 then again the red was only 1 of 4. this skein isn’t quite as underplied as the first, but it still has a slight S twist. the dyeing has really taken its toll on these fibres, (noticeably more on the fibre that i overdyed, much better to get it right first time in future) they’re quie matted and “sticky”, if not actually felted. the first skein is quite dry and scratchy so i added a little lanolin to the twist setting wash, which made it noticeably softer. balanced at last! this skein is slightly fatter than the previous 2, but much smoother, since i realised how much difference predrafting makes. i’m happy with the colour mix too. i used much shorter sections of fibre so there aren’t the long single-colour stretches that the others have, which makes for more interesting combinations where you have 1 strand of 1 shade and 2 of another. will be very interested to see how the combinations look once crocheted (these are destined to become a basket to keep finished yarns in, hope there’s enough).